These students have done an outstanding job at the Technical College High School and are demonstrating the leadership, attitude, skills and knowledge that is so highly valued. Please help us share in the pride of their accomplishments. Delaware County Community College has announced the availability of the W.W. Smith Charitable Trust Scholarship for the 2016-17 academic year. Please check the scholarship listing in Family Connection or visit the Kennett High School counseling office for more information about how to apply for this scholarship. The Kennett Consolidated School District is proud to announce that U.S. News & World Report and the Washington Post have named Kennett High School one of America’s Best High Schools and one of America’s Most Challenging High Schools, respectively. To produce the 2016 Best High Schools rankings, U.S. News & World Report teamed up with North Carolina–based RTI International, a global nonprofit social-science research firm. The comprehensive rankings methodology is based on the key principles that a great high school must serve all of its students well, not just those who are college bound, and that it must be able to produce measurable academic outcomes to show it is successfully educating its student body across a range of performance indicators. For more information on the U.S. News & World Report’s and the Washington Post’s ranking processes and details on Kennett High School’s rankings, please visit http://www.usnews.com/education/best-high-schools/pennsylvania?int=9abb08 and http://apps.washingtonpost.com/local/highschoolchallenge/schools/2016/list/pennsylvania-schools/. 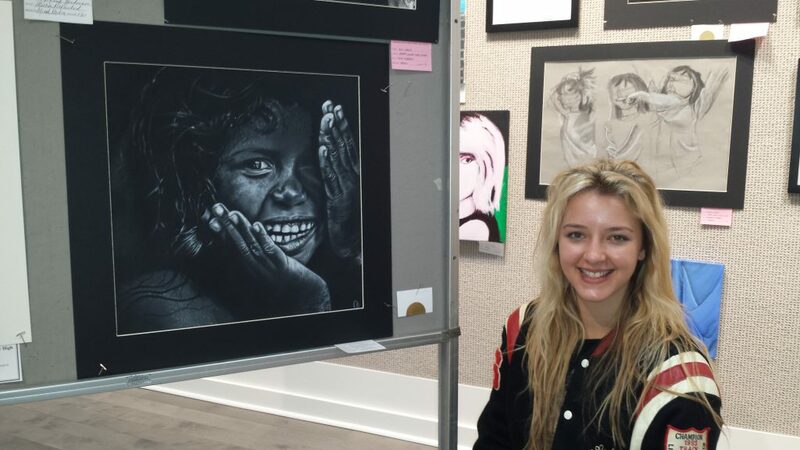 Two Kennett High School seniors, Olivia Avedisian and Bailey Reigel, were recognized for their exceptional talent at the 42nd annual Area High School Show. The juried exhibition was held at the Chester County Art Association in West Chester from April 23 to 30. 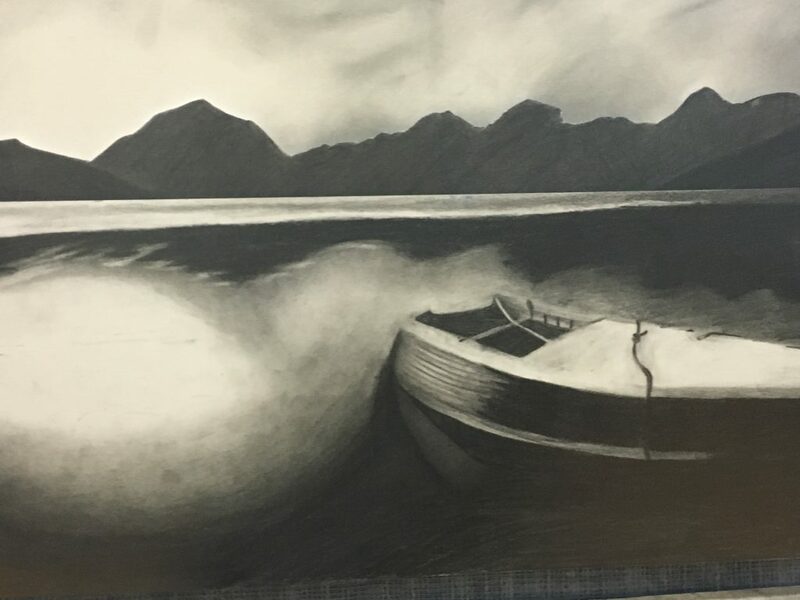 Olivia Avedisian earned a First Place Award/Chester County Art Association Board Excellence Award for her untitled charcoal work. Olivia is a student in Mr. Tom Hironimus’s Advanced Art III class. She carries on a proud tradition, as this is the same award Amelia Pagliaro won in 2012, and Noelle Raezer won in 2014. “Winning was a big surprise. It’s an honor that I wasn’t expecting, and it’s really special, since it’s my senior year,” she added. 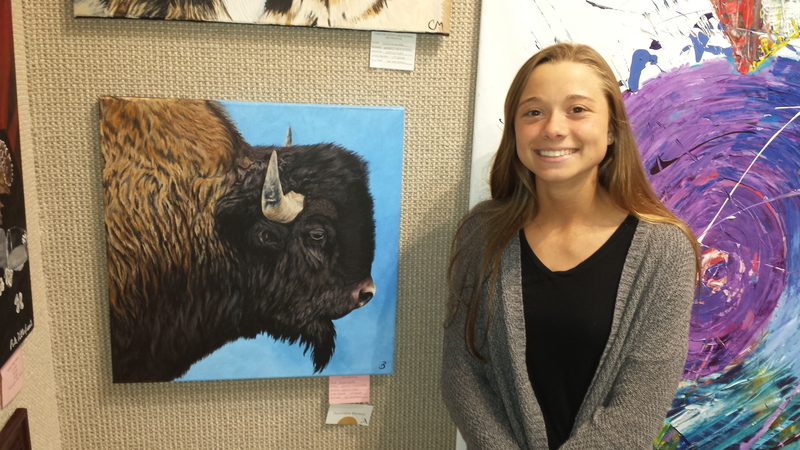 Senior Bailey Reigel, a student in Mr. Hironimus’s Advanced Art II course, won a Chester County Art Association Board Honorable Mention for “Buffalo,” an acrylic painting. “Art makes me feel peaceful. I’m a high energy person, and art makes me feel calm. The reason I chose to do the buffalo is because I just liked the picture I based it on. I took the picture myself when my family was in Yellowstone last summer,” explained Bailey. “I owe a lot to Mr. Hironimus. He’s a great teacher. An inspiration. Everybody likes him. Everybody respects him. Everybody listens to him. He’s amazing,” she added. 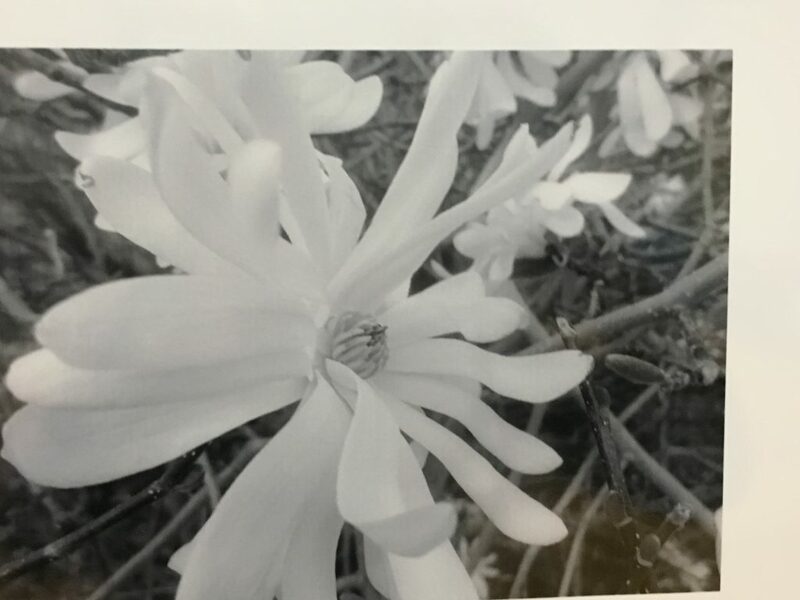 The exhibition displayed over five hundred pieces of artwork from all Chester County high schools brought together by the Chester County Intermediate Unit, including over twenty-five works by Kennett High School artists. Everything from drawing and painting to computer generated art, to found object sculpture, ceramics, jewelry, and more showcased the talents of area students. 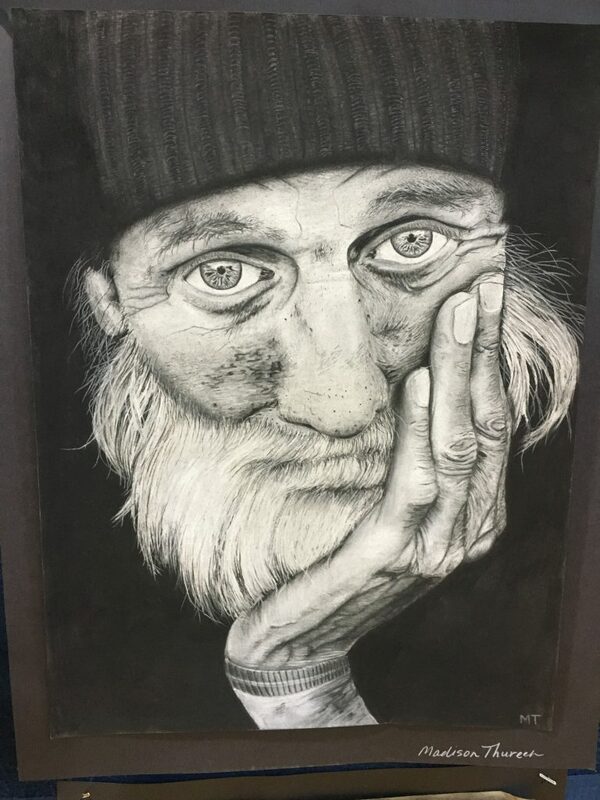 Kennett High School artists displayed their impressive talents for their fellow students, teachers, staff, and members of the community on Friday, May 5, at the high school. The show included works from all classes within the Fine Arts Department: from Basic Art to Advanced Art, from Ceramics to Graphic Art to Photography. Teachers Mr. Tom Hironimus, Mrs. Kathy Caputo Nelms, Ms. Katie Gray, and Ms. Jodi Davidson guided their students through the creation and exhibition of their artwork. “The creativity of our students is amazing. 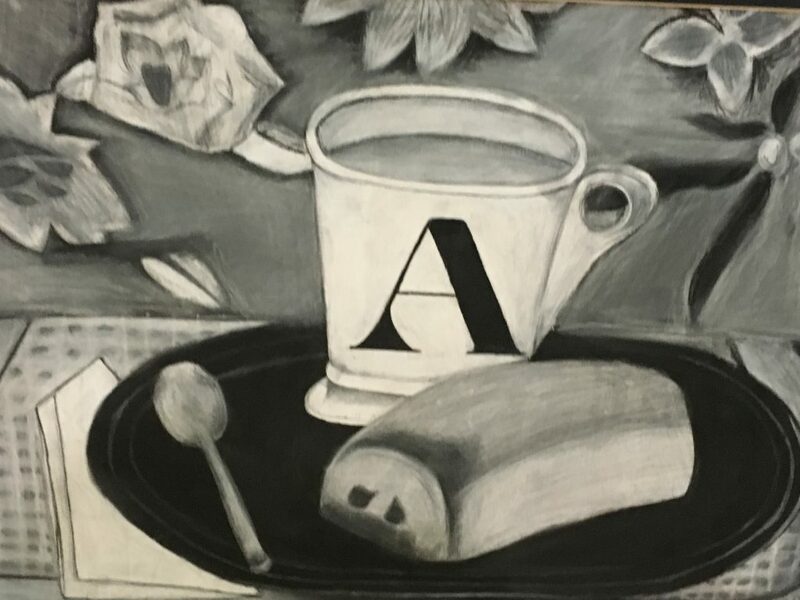 The original student artwork displayed showed a diverse range of personal subject matter, creative self-expression, and experimentation with medium,” said Mrs. Caputo Nelms. “Kennett High School art students are extremely hard working and incredibly talented. They are dedicated to getting better every day and being the best they can be. It is a blessing to be surrounded by such enthusiastic and committed students,” added Mr. Hironimus. A variety of clubs and activities also had booths at the show. Future Business Leaders of America (FBLA), Gender Sexuality Alliance (GSA), Demon Robotics, and the Humanitarian Club-sponsored MiniThon all used the opportunity to disseminate information and raise funds for their organizations. On Monday, May 9, Kennett High School’s team finished 10th out of the 78 teams competing at the Temple University 7th Annual OWLympiad. Hosted by the Department of Risk, Insurance, and Healthcare Management and the Sigma Chapter of Gamma Iota Sigma at the university, the event is Philadelphia’s lar gest math competition for high school students and is designed to promote mathematics and introduce students to career paths in applied mathematics. Competing from Kennett High School were juniors Lydia Pebly, Austin Maxwell, Zachary Hrenko, and Delaney Chaffin. The students were accompanied by mathematics teacher, Dr. Alicia Tamargo. “This is the fourth year that Kennett High School has entered a team. We compete against both public and private high schools at the event, including teams from Downingtown High School, Council Rock High School, Spring Ford High School, and Henderson High School. This year’s team’s 10th place finish definitely continues our tradition of excellence,” explained Dr. Tamargo. The competition consisted of a 50 minute, multiple-choice exam that tested topics ranging from basic algebra to calculus and statistics; a “24” Math Card Game Competition; and a “Quizzo”-style lightning round. Kennett High School scored 78 of a possible 96 points across the three events to earn their 10th place honor. According to the OWLympiad website, the competition is “an opportunity to engage local high school students, in the midst of their college search, and expose them to Actuarial Science as a career choice. Actuaries specialize in the evaluation of insurance and financial risk. They hold positions of responsibility with insurance companies, consulting firms, investment banks, government regulatory organization, and government insurance programs.” Temple’s Actuarial Science program is one of the most distinguished in North America and has been recognized by the Society of Actuaries as a Center of Actuarial Excellence (CAE), one of only thirty institutions to receive this honor. Kennett High School senior Mary Nichols continues to make waves in a male-dominated sport, winning her eighth wrestling state championship title. Her love for wrestling began when she was just six years old. After watching her cousin wrestle for Kennett Middle School, Mary asked her parents if she could wrestle too. 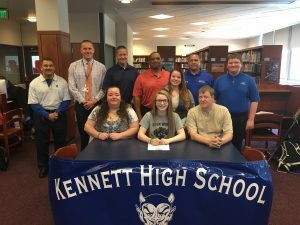 Now, almost 12 years later, Mary has been a member of Kennett High School’s varsity wrestling team for four year s, has won eight state championship titles, and has recently been awarded an athletic scholarship to continue her wrestling career at Ferrum College this fall. Dedicated to the sport she loves, Mary wrestles year round with Kennett High School’s wrestling team and an all-girls club team, Team Pennsylvania. In her free time, Mary volunteers in a youth wrestling program, acting as a role model to aspiring wrestlers. 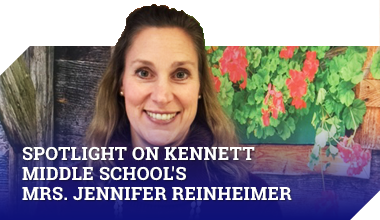 The Kennett Consolidated School District is proud of Mary’s accomplishments. 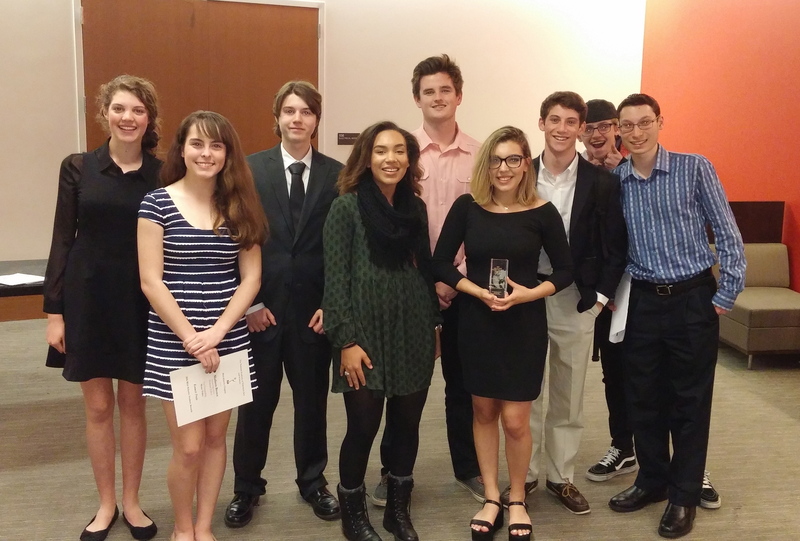 On Wednesday, May 4, the Mid-Atlantic Chapter of the National Academy of Television Arts and Sciences (NATAS) presented awards to seven Kennett High School students. Since 2002, the NATAS awards have recognized outstanding cultural, educational, technological, entertainment, news, and informational achievements by high school students who are pursuing careers in media and journalism. More than 150 students from more than a dozen high schools throughout the Greater Philadelphia region attended the event held at Drexel University in Philadelphia. Kennett High School students were accompanied by Mr. Frank Vanderslice, video production teacher. Kennett High School senior Giovanna Ruggio garnered her category’s top prize, an Arts and Entertainment Emmy, for her production of “Practice Makes Perfect.” The film documents the life of a tap dancer as she choreographs, practices, and performs. The featured tap dancer is Giovanna’s best friend, so it was important to Giovanna that she portray the story well. “I really wanted to give her a ‘pedestal’ moment,” she said. “Going to the Emmys, I was nervous. I’d never gone to a competition like this before. I was afraid that, if I didn’t do well, I should reconsider my major. But, I won, so it made me even more excited for next year and the future,” Giovanna explained. Giovanna’s award represents the third Emmy won by a Kennett High School student in recent years. Mr. Vanderslice commented that Giovanna “Just has an eye for editing. She’s so precise. People don’t realize the skill that it takes, timing each cut.” Giovanna will attend Temple University in the fall, majoring in Film and Media Studies. Other Kennett High School students receiving Awards of Excellence include Madison Brown and Nijia Walls, who were honored in the Outstanding Music Video category for their film, “Kennett Pride;” Sean Rodgers, Luciano Spera, Michael Bellino, and Giovanna Ruggio who were honored in the Long Form – Fiction category for their work, “The Inevitable;” and Jack Ryder, who was honored in the Writing category for his film “Project Vigilante.” Additionally, Giovanna Ruggio was recognized in the Long Form – Fiction category for “Try.” Maggie O’Sullivan and Kyle Sheridan also entered their production work into the competition. Junior Jack Ryder’s entry, “Project Vigilante,” took him three months to complete. With a plot Jack describes as being similar to Rolling Thunder, the film chronicles the adventures of a hit man targeting Russians as he avenges the death of his friend. He filmed the project in locations all over Kennett Square. “The project taught me a lot more about the process of film making, directing, scheduling, and troubleshooting editing software,” observed Jack. Mr. Vanderslice is extremely proud of his students and the quality of their work. “I think this was our most successful year in terms of the number of entries we had and the number of awards received. I could see how dedicated the students were to putting in the time and effort to produce quality work. Each year the competition grows more intense as more schools participate. I think the number of schools competing has doubled in recent years,” said Mr. Vanderslice. 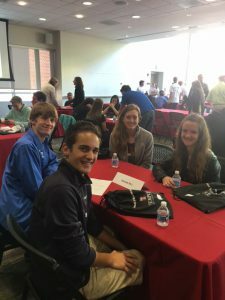 “This year, students got a chance to meet professionals in the field and talk to college students about their experiences and how much time they put in,” Mr. Vanderslice added. On Tuesday, May 10, there will be a brief student meeting for all students taking the Keystone Exams. The meeting will be held during 3rd period in the auditorium. Students are to report to their 3rd period class as normal and an announcement will be made for them to come to the auditorium. Students who are testing received an email via their Kennett Consolidated School District email account. Kennett High School will host annual Spring Art Festival on May 5th. The exhibit will feature creative works by Kennett Consolidated School District students, alumni, teachers, staff, and local artists. The Spring Art Festival will be held in Kennett High School’s Auxiliary Gym and will be open from 9am-2pm and from 6:30-7:30pm.